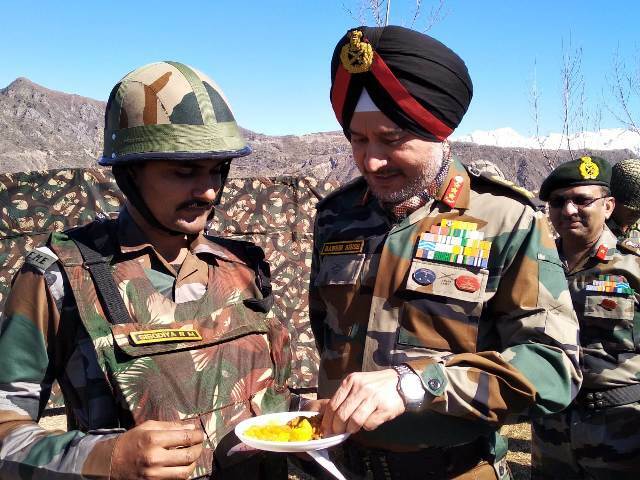 Poonch, November 7, (Scoop News)-Lt Gen Ranbir Singh, Army Commander, Northern Command, accompanied by the White Knight Corps Commander, Lt Gen Paramjit Singh visited forward posts of Poonch Sector to convey Diwali greetings to troops. During the visit to the sector, the Army Commander distributed sweets to Army and Border Security Force troops deployed on the forward posts. The Army Commander interacted with soldiers and complimented them for their unwavering dedication to duty, selfless devotion and high standard of professionalism. The Army Commander was appreciative of the high morale of troops who are away from their near & dear ones. He also complemented soldiers for measures and standard operating procedures instituted by the units and formations in their area of responsibility to minimise the casualties due to cease fire violations and infiltration bids. The Army Commander also exhorted all ranks on the need to remain vigilant to counter the nefarious designs of the enemy and anti- national elements and to ensure a robust counter infiltration and counter terrorist grid to enable continued peace and stability in the region.